Medieval Realms from the British Library. In this web resource you will be able to examine evidence in a number of medieval illuminated manuscripts, finding out more about the social history of the period. TimeRef.com - Explore the history of the Medieval period from the time of Alfred the Great through the Norman Conquest and up to the start of the Tudor Age. Includes detailed timelines, maps, castle plans and listings of people. 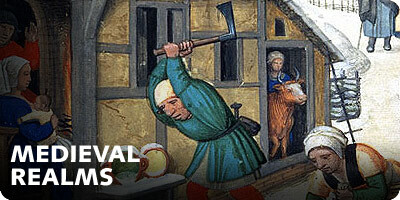 Middle Ages is a well presented site covering feudal life, religion, homes, clothing, health and town life. 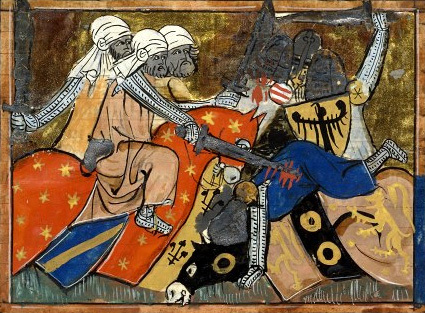 Battle of Ager Sanguinis, 1337. Image from Wikimedia Commons. Content and Photos by M.Foster and M.Foster Photographers.